Two things drove this particular Forgotten Film post. First, since good friends and colleagues Paula (of Paula’s Cinema Club) and Kevin (aka Jack Deth) hosted and contributed handsomely to the recent What A Character blogathon with another wonderful piece (this time spotlighting actor Richard Jaeckel), I thought it appropriate to dust off an old look-back article of mine for a film the three of us love. And second, it’s in keeping with the World War II theme my duo-post partner Rachel and I will have going for the close of September. It was the summer of ’67, and remains keen even in this old-ish mind of mine. I being a dozen years old back then became highly aware of — and secretly wanted to be as cool as — the actor Lee Marvin. The moment remains crystal. Heading over to the Warner Theatre in Huntington Park as June turned into July that year, I became mesmerized to that very fact as I took in Robert Aldrich’s The Dirty Dozen. Growing up, every kid I knew had seen Marvin plenty of times before in reruns of M-Squad. Plus, his guest appearances as the heavy-of-the-week on TV shows of the time (Rawhide, Bonanza, etc.) and older movie westerns (Comancheros, The Man Who Shot Liberty Valance, and others) only added to the exposure. Yet, it was in this action/war film that the real impression of Marvin, the man, was gauged. At least by me. Here was where that no-nonsense aura of good ol’ American red-blooded maleness was ingrained into my susceptible pre-teen psyche. I’ll stipulate for the record that being tough/cool then was a hyper-dimensional shift away from what that means today. It was definitely a more masculine era ages ago (for better or worse). Plainly, what courses as the contemporary equivalent need not apply. From that point on in the summer of 1967, if Lee Marvin was in a film, I had to see it. Whether it was on television or the movie theater, it was a given. Having caught films like Richard Brooks’ rousing western The Professionals, or the earlier and highly underrated war drama, Attack, which was also directed by Aldrich, as TV fare was nothing to sneeze at. More so if it was on the big screen with the likes of Point Blank, Monte Walsh, Prime Cut and others. Personally, I place Lee Marvin in the same class of actor as the great Robert Mitchum, skill and reputation-wise. Both were the type of actor who could effortlessly pull off their roles as rugged, dangerous, but oh so self-possessed men. Marvin and Mitchum seemed cut from the same cloth in that regard. There certainly was no shortage of testosterone when these guys were in the room (or on-screen). Each of them was a man’s man (yes, an old maxim, if there ever was one… but it still fits here). 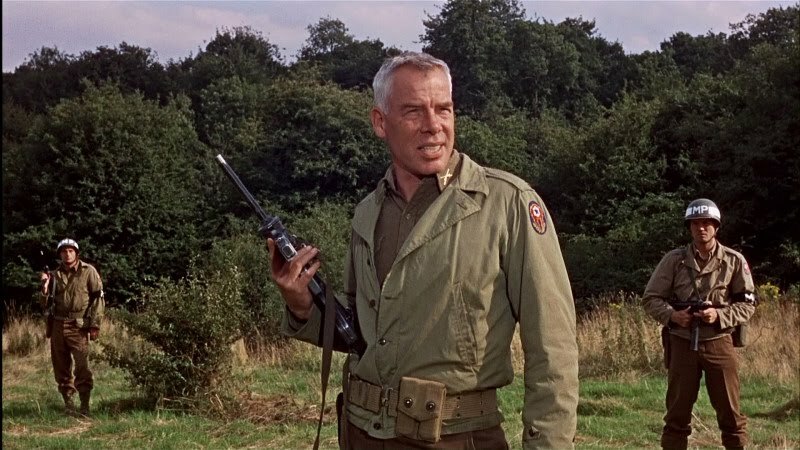 After viewing The Dirty Dozen, I could only imagine if guys were going into battle, they’d want someone like Lee Marvin as their squad leader (he being a former Marine from WWII, in actual fact). And they’d, beyond question, dread having him as their nemesis, as well (especially, if he was leading their squad). When I remember this actor, I instantly think of him in the role of Major John Reisman, right along with this one-of-kind war film. If there’s one film that served as the template for ‘men on a mission‘ movies, I’d have to nominate The Dirty Dozen as it. Like some of the big pictures of the period, it had an extraordinarily rich cast. Besides Marvin, it boasted as having the sturdy likes of Charles Bronson, Ernest Borgnine, John Cassavetes, George Kennedy, Robert Ryan, Ralph Meeker, Clint Walker and early significant roles for the budding talent of Donald Sutherland and the football legend Jim Brown. Add to this a rousing style instilled by the filmmakers that brought the actors on the screen to the full and cheering clamor of the audience. The film’s director would mine a similar subversive level a few years later, featuring the same undisguised and rebellious ferocity, with 1974’s The Longest Yard (and don’t get me started on the lame Adam Sandler remake of 2005). Still, nothing packed a wallop like this wartime actioner. Robert Aldrich‘s films historically celebrated a defiant individualism, and had a decidedly anti-establishment bent to them. Obviously, The Dirty Dozen was no exception. Even amongst the humor and action of the piece, there is an intense disdain of authority at its core and in its telling of the behind the lines (and somewhat gonzo) pre D-Day raid it depicted. That much was certainly clear since the film’s military leadership (represented so snakily well by Borgnine and Robert Webber as the generals in question) handed Reisman what amounted to a suicide mission for his fealty. By today’s standards, its violence is not that shocking. Still, the high body count made for a good bit of criticism by some when it was first released. The efficient, and almost carefree, manner our merry dozen go about eliminating German soldiers (especially the officers) at its climax was probably a point of pride for the filmmaker. That didn’t stop it from being popular with the movie-going public, though. Far from it. Especially, as the Vietnam War was really beginning to boil to the forefront at the time. We, the movie patrons, could eat it up without too much cynicism since Tet was still months away. Regardless, visually it remains an amazing experience for those who’ve seen it in a movie theater. It’s tailor-made for the big screen. What’s interesting to note is the film was originally released in a blown up 70mm format called “Metroscope“. As good as today’s high-definition Blu-ray Discs and flat-panel home theater set-ups can be, this is one of those motion pictures, if you’d ever get the chance to view it in a movie hall, that’s not to be missed. 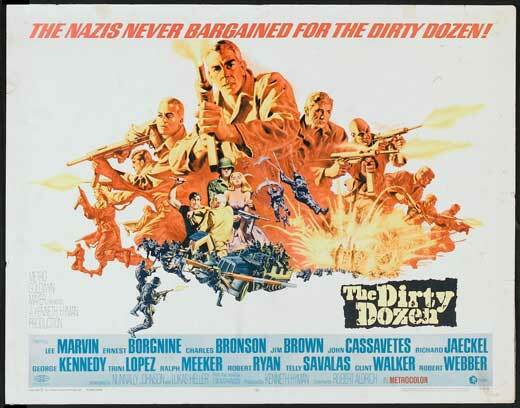 A couple of years back, The Dirty Dozen and Attack were on the bill for the Robert Aldrich Double Feature event for a Memorial Day weekend screening by the American Cinematheque Los Angeles. While I have this film on DVD and BD, catching it on the big screen once again was a treat beyond measure. Not only did it showcase a true rebel, a highly underrated director far too many of today’s young moviegoers and filmmakers overlook, it demonstrated how great this old film (it turned 45 this year), and the screen presence of one Lee Marvin, really was. Let it be said though, director Quentin Tarantino gave this film an indirect homage with his vigorously dialogued and unique take of the genre in 2009’s Inglourious Basterds. While it was a wilder remake of this ’78 war film, which was itself a poor man’s version of Aldrich’s, both movies had their similarities. However, as much as Brad Pitt tried, his Lt. Aldo Raine will always take a backseat to Marvin’s Major Reisman, in my opinion. That said, I did get to re-encounter The Dirty Dozen in the same historic movie theatre where I first saw The Empire Strikes Back 30 years prior. And well, that turned out to be just icing on the cake. Thank you very much, Tyson. Excellent as always Michael. It’s been too long since I’ve seen this classic. Yes, this is a film that’s so entertaining, yet with Robert Aldrich’s sense of things, that’s worth periodic screenings. Thanks, Mark. Fantastic write-up. Love this film and watch it every so often. Whenever I do it reminds me of my grandfather who was a big Lee Marvin fan and the times I would watch it with him as a kid. Good times. Agreed! These guys are definitely cut from the same cloth and really embodied what it meant to be a man. Thank you very much, J.D. I certainly can understand your experience with the film and the Lee Marvin fan that was your grandfather. This is a film and that readily lends itself to such memories. I haven’t seen this movie in a long, long time. Now, thanks to you, I’m going to have to borrow it from my local library and watch it. Oh, yeah! Teeing this one up is something I well support. Many thanks, John. Thanks so much for the fine introduction. 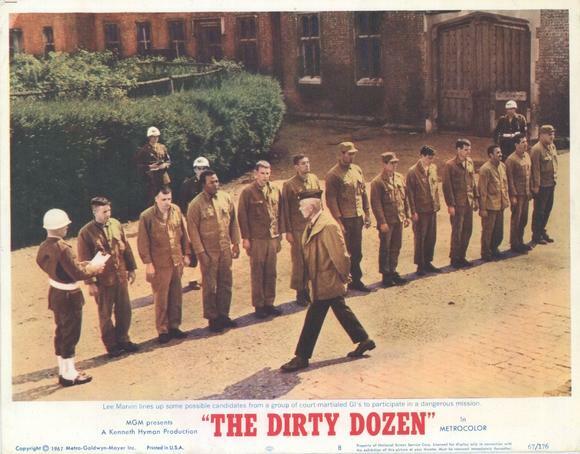 ‘The Dirty Dozen’ ranks very high in my personal category of ‘Guy Flicks’. Led by the always intriguing tough guy, Lee Marvin. No other actor handled a rifle or pistol with such familiarity, respect and ease. Great cast. Believable plot and superbly executed story. In one of the first and best of the ‘Badass genre’, which Mr. Marvin and many of his ensemble were made for! Always my pleasure to give you a shout-out, my friend. Yes, this is one of the ultimate ‘Guys Flicks’, alright. As you state, Lee Marvin was “always intriguing” and a “tough guy”. He did handle weapons effortlessly and naturally, didn’t he? Thanks, Kevin. Robert Aldrich and Lee Marvin – two great favourites of mine! The machismo, grit and cool cynicism fairly pummel you into submission, and leave you wishing it could keep on coming. They did fit and work together well, didn’t they? Truer words, Colin. Many thanks. Michael, you give such great context for the films you write about. This makes it a richer experience when I see them again 🙂 I sort of thought QT was alluding to THE DIRTY DOZEN in Raine’s first scene in INGLOURIOUS BASTERDS. I’m so far from being the target audience for both IB and DIRTY DOZEN. After some thought, I’ve decided that in addition to enjoying a good action picture, I just like seeing the Nazis lose. You’re very kind, Paula. Love this comment! We’re definitely in the same boat with your statement ;-). Thank you so very much. I love Lee Marvin’s voice. I think it adds intensity to the films he is in. Great point, Marianne. Lee Marvin’s voice could denote so much, and he used it so very well in whatever he did (TV or film). As a villain or hero, the man was somethin’! Thank you, Marianne. Great look at this movie… I dont know that it’s forgotten… well, maybe it is. But the title stuck in pop culture. Now its a famous phrase! The movie will always have that association! Great quote to bring up, Fogs! And it did have one Hell of a cast. I did go round and round about calling it a forgotten film. Ten, fifteen years ago I’d never have considered that. It remains well known among the fans of the director and lead actor. Yet, when Tarantino’s film, IB, debuted the talk of ‘Inglorious Bastards’ from ’78 (a source of the remake) seemed to stop there without giving due to what Aldrich accomplished with ‘The Dirty Dozen’ the previous decade. That basically told me, now 45 years later, that younger moviegoers were kinda of ignoring such older, great fare like this. Hence, I included it as something I wanted to spotlight and not have anyone ‘forget’. Thanks so much, my friend, for the deft comment. One of the great war movies of all time. I really don’t think it was forgotten though. Maybe somewhat overlooked next to the Magnificent Seven and Seven Samurai but I think a lot of people appreciate this film’s greatness. Please reference what I said to Fogs about this point. Yes, I readily admit this film, among certain groups of movie fans, this is far from a forgotten film. Yet, as more time passes amid today’s younger audiences, ‘The Dirty Dozen’ is something they (perhaps) have heard of, but haven’t seen. Lee Marvin, same. 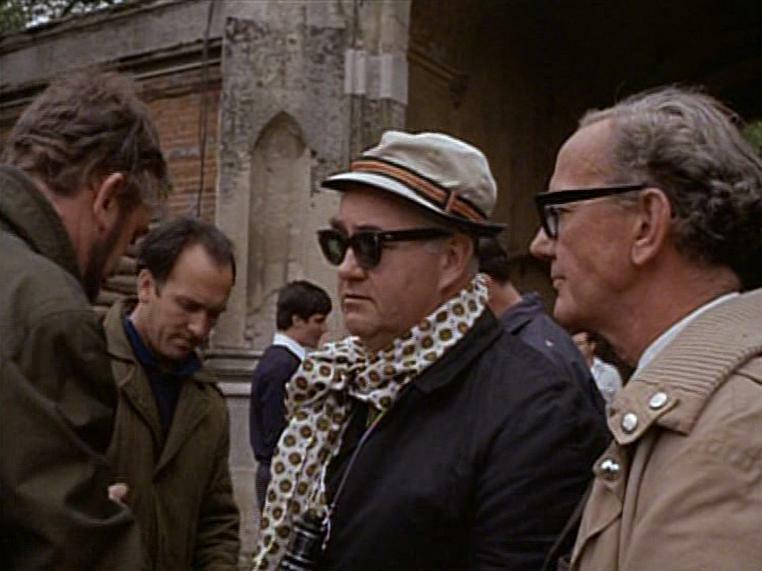 Robert Aldrich, less so. And that’s really unfortunate. Just my way of promoting and appreciating the set. Thanks for reading and the comment, my friend.